Capricorn English Goats Cheese is available both prepacked and from the Cheese Service Counter. It has a soft texture and subtle flavour that complements the warm spiciness of Peppadew sweet piquanté peppers, which can be found on the grocery shelves. Here the peppers and cheese are combined with pasta for a stylish supper dish. Cook the rigatoni in a large pan according to the pack instructions, then drain. Meanwhile, place the olive oil, garlic and basil in a pan and season. Heat until the basil begins to sizzle. Stir the goat's cheese and piquanté peppers into the basil mixture and heat until the cheese begins to soften. 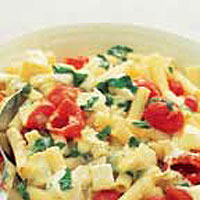 Spoon the basil, goat's cheese and pepper mixture onto the pasta and fold together. Serve with a mixed leaf salad or a fresh tomato and cucumber salad. If you enjoy hot, spicy food, you can use hot Peppadew piquanté peppers in place of the mild. Continue the Italian theme and serve frozen Prospero Raspberry Tiramisu, from the freezer cabinet.